Toshiba Introduces New Healthcare Business Strategy – Canon Medical Research USA, Inc. Toshiba Introduces New Healthcare Business Strategy – Canon Medical Research USA, Inc.
Canon Medical Research USA, Inc.
Toshiba Corporation (TOKYO: 6502) has introduced the strategy that it will promote to establish its healthcare business as a third main pillar of operations, along with its energy and storage businesses. The core of the strategy is to develop four business areas, prevention, diagnosis and treatment, prognosis and nursing care and health promotion, with the aim of achieving 600 billion yen in sales in fiscal year 2015. Diagnosis and treatment is an already tried and tested business that includes such diagnostic imaging equipment as computed tomography systems. 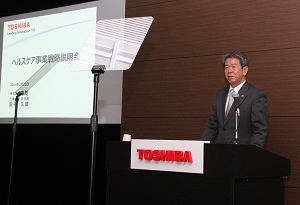 Toshiba will now cultivate prevention, which includes reducing the risk of ill by monitoring and predicting individual health; prognosis and nursing care, which will offer services that reduce burdens on families and other caregivers, and help patients to continue to live at home; and health promotion, which will seek to develop safer living environments and support for mental and physical health, so as to help people to continue to lead happy lives. Toshiba will promote the healthcare business globally and combine and integrate diverse, wide-ranging technologies, towards building a society where people lead healthier, happier lives. © 2013–2019 Canon Medical Research USA, Inc. All Rights Reserved.